An Optical Manufacturing Unit was started by the Society in the year 1971 with a view to provide services to the patients and dispense the prescribed glasses on the minimal charges. 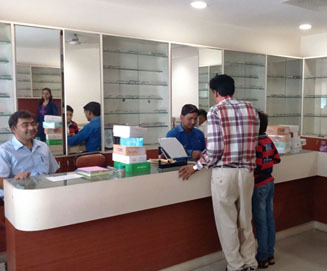 Besides training the optometric technicians, it runs a regular optical counter at Dr.Rajendra Prasad Centre for Ophthalmic Sciences where frames of latest designs, of all makes are displayed and are available in sufficient stock for sale. The prescription of glasses is dispensed within the manufacturing unit and patients are supplied spectacles as far as possible on the same day. The speciality of this section is that it is selling the spectacles at no profit no loss basis. Society has a workshop where spectacles prescribed by ophthalmologists Dr. R. P. Centre are being prepared and supplied to the patients at reasonable rates. It is also a training Centre for B.Sc. (Hons.) students of Dr.R. P. Centre in grinding and fitting of ophthalmic glasses. The Employees State Insurance Scheme has also been getting spectacles for its insured patients from this unit at subsidized rates. Society also has a sale counter at NSPB Eye Hospital, Moti Nagar, New Delhi.